The Wall Street Journal reports that automakers are asking the EPA to repeal automobile fuel economy standards, known as Corporate Average Fleet Economy (CAFE) standards, which are set to rise to 56 miles per gallon by 2025. Repealing the standards would be a good idea, provided they were replaced by a tax designed to achieve an equivalent saving in fuel. A carbon tax would do the job nicely, but an increase in the existing tax on motor fuels would also work. What exactly is wrong with the CAFE standards? The fundamental problem is that they attack the third-party effects, or negative externalities, of motor fuel use, such as pollution, highway congestion, and accidents, only partially and indirectly. As a result, the cost of achieving a given reduction in fuel use via CAFE standards is higher than it would be if the same result were achieved more directly through a carbon tax or an increase in the federal gasoline tax. To understand why, we need to consider the various ways consumers can cut back on fuel use. In the short run, they can buy an efficient hybrid instead of a gas-guzzling SUV, they can reduce discretionary driving, or they can shift some trips from their Ford F-250 to their Honda, if they happen to have one of each in the driveway. Given more time to adjust, they can make work and lifestyle changes, like moving closer to public transportation, work and shopping, changing jobs, or working at home. Economists refer to the tendency of more fuel-efficient vehicles to induce additional driving as the rebound effect. For example, suppose a 10% increase in fuel efficiency would cause a 3% increase in driving. The increased miles driven would partly offset the increase in miles per gallon, so total fuel consumption would decrease by only about 7%. To the extent that externalities are proportion to the quantities of fuel consumed, as they are in the case of air pollution, higher CAFE standards are still somewhat helpful. However, the rebound effect causes an absolute increase in those externalities that are proportional to miles driven, including road congestion and traffic accidents. It also increases the cost of road maintenance, because the wear and tear from more miles driven is only partly offset by the lower average weight of high-mileage vehicles. 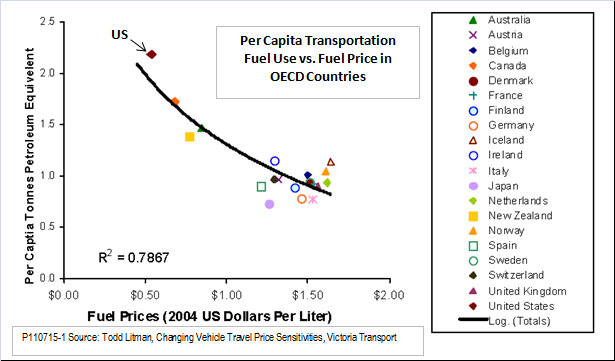 The variable most critical to the size of the rebound effect, and therefore to the relative merits of CAFE standards vs. fuel taxes, is the price-elasticity of demand for fuel, that is, the percentage reduction in fuel use for each one percent increase in fuel price. The less elastic demand is, the stronger is the case for CAFE standards; the more elastic, the larger the rebound effect and the stronger the case for raising fuel taxes. To be sure, not everyone will be convinced by elasticity studies. They are just numbers. Some people will continue to believe prices have no effect on driving behavior, that people will just drive whatever and wherever they want regardless. Here is a picture, then, that is worth a thousand meta-analyses. Taken from the Litman study cited above, it shows a convincingly tight relationship between fuel prices and fuel use across OECD countries. Can it really be just coincidence that the United States, with the lowest fuel prices, also has the highest fuel consumption? It is a classic case of the TANSTAAFL principle - There Ain't No Such Thing As A Free Lunch. If you try to make something look like it's free, it only ends up costing more in the long run. If you are a politician, you may well prefer a big hidden cost to a small visible cost. If you're a friend of the environment, you should know better.